My teen daughter went from a large closet to an average size closet with our last move. Oh, the joys of moving to a smaller home. 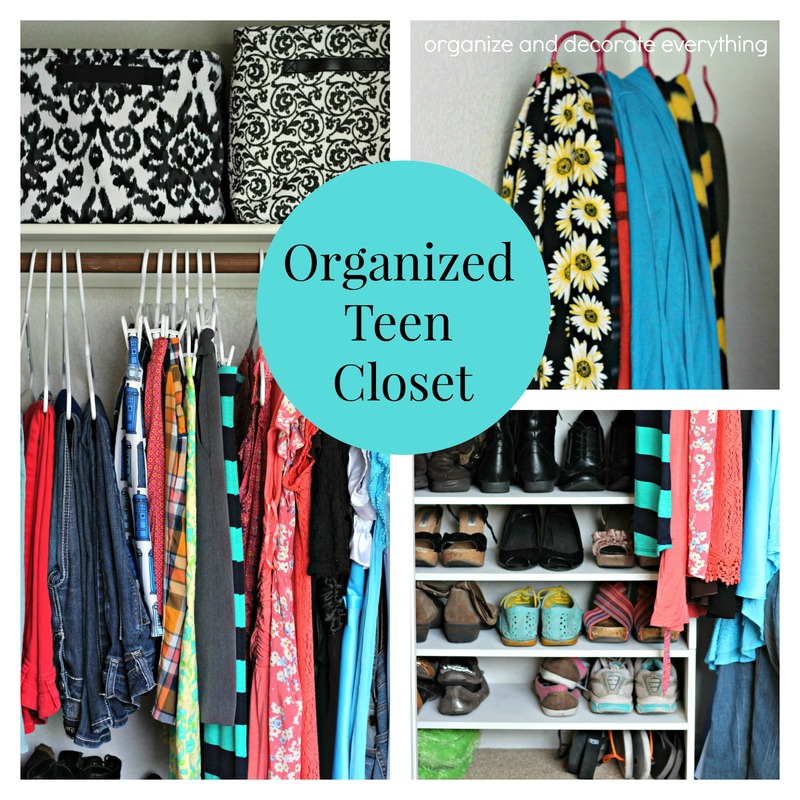 I’ve talked about portable storage solutions in the past and that is the key to this Organized Teen Closet. The first step was to get rid of the excess, or what we usually call clutter. 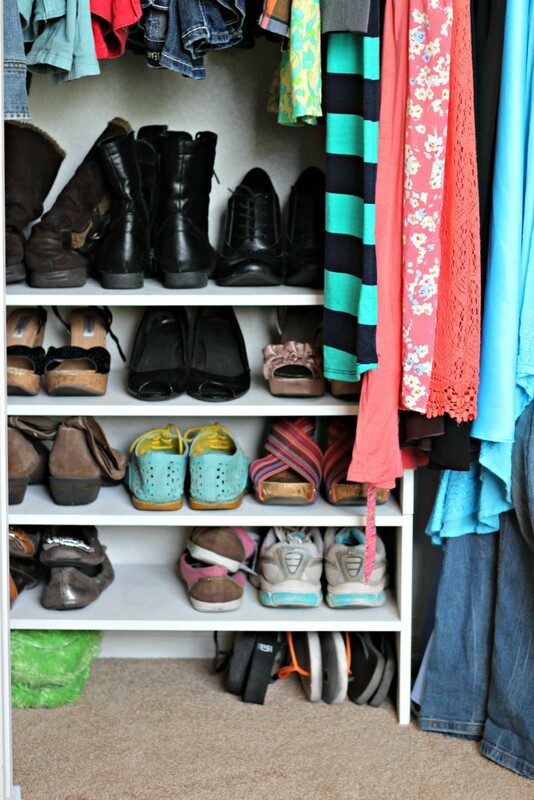 We found a solution to the clothes clutter and if you have a teen daughter you might want to do this. We rounded up all her clothes she hadn’t worn for 6 months and also ones she just wanted to get rid of and we took them to a consignment shop. This is the perfect way to earn money for new clothes and get rid of ones that are just taking up space. Plus it gave her plenty of space for the clothes she actually wore. Group like items together to make it easier to find what is wanted. I place mine in color order but with the teen we are happy to just have them hung up. I didn’t have to buy anything for this closet makeover, except 2 packs of hangers. All we did was declutter and organize the space. 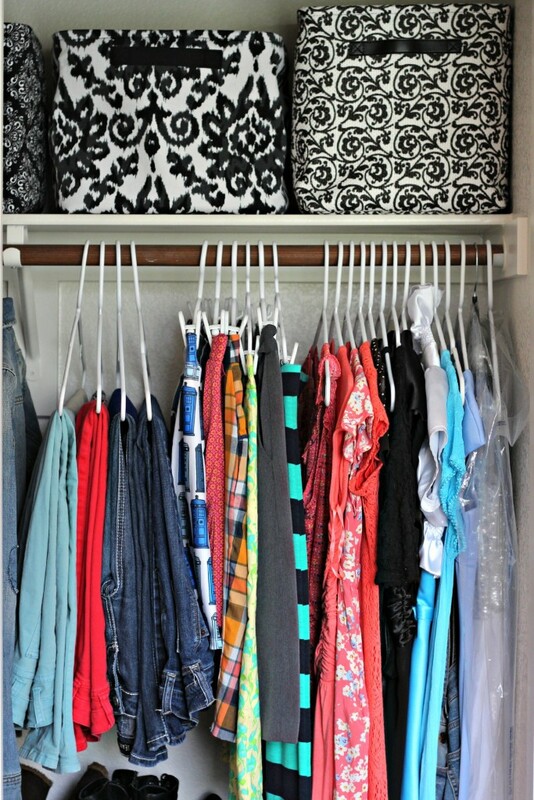 Having the same size, type, and color of hangers just makes everything look neater and cohesive and the plastic ones are very inexpensive. 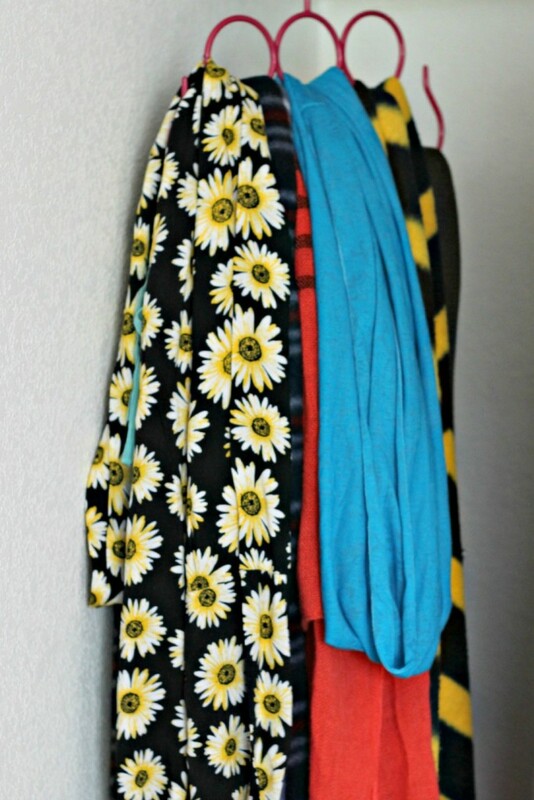 She had already been using the scarf hanger but we got rid of the scarves she never used and added belts to the mix. Don’t you always want to know what’s inside boxes or totes? The soft sided totes across the top shelf hold extra text books and study material, dance and theater shoes, extra bags, and hats (beanies). These stacking shelves and canvas totes came with us from our last home. We just had to use them differently to make this small closet space work to our advantage. The polka dot box holds a few keepsakes. 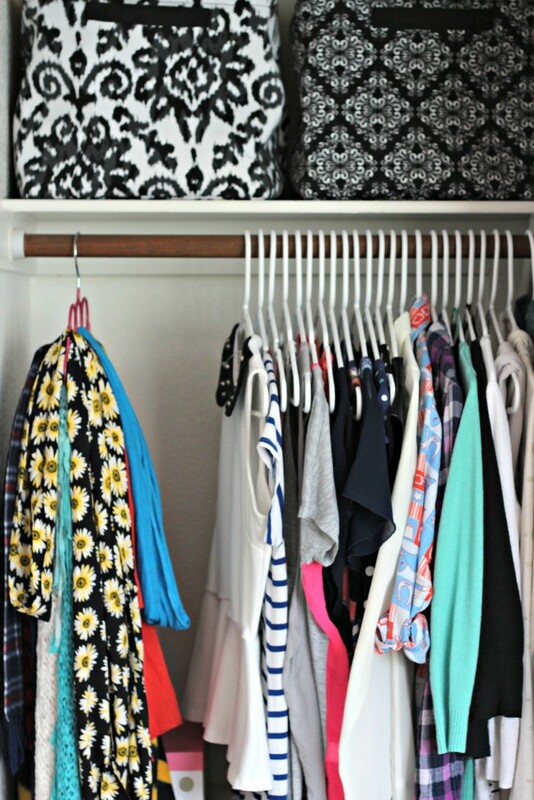 Want to know the great things about totes in a teen room? 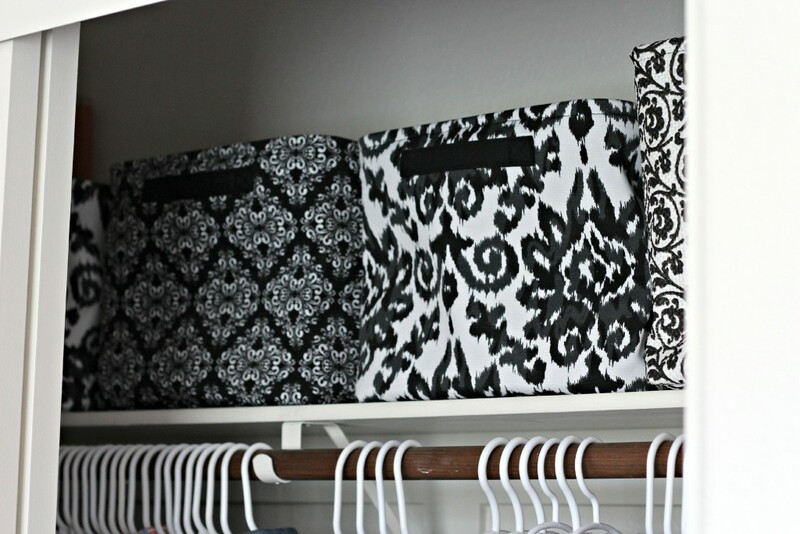 The totes don’t have to stay neat inside but they help contain the items so the space is clutter free and organized. These shoe shelves are also from our previous house. There are only 2 here, but stack as many as you need in your space. We took the things she rarely used and placed them in lidded boxes under the bed to give her more space in the closet. Don’t over crowd your closet or it makes it hard to find what you want and will easily get cluttered and unorganized again. The teen is pretty much in charge of keeping her space neat and organized but it makes it so much easier to keep it that way once it has been brought to that point. 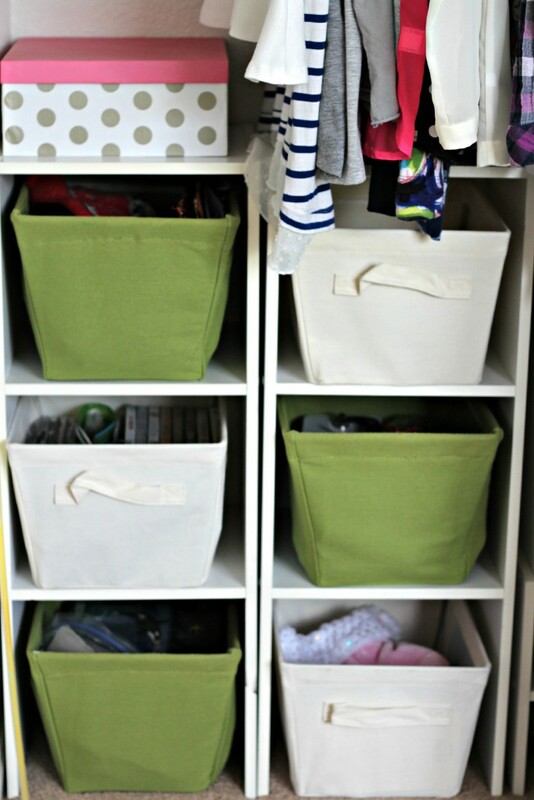 Don’t worry about spending a lot of money getting organized, just use what you have to get that space neat and tidy. Looks great. Only problem with my “teen” (ahem, 21 yr old) -she never puts the things back in the soft totes. They end up under her bed, in the bed or just tossed in the floor. She has ADHD so I do a lot of reminders and labeling which helps some. We moved recently and although her now closet is smaller it works better somehow. The old one was odd shaped and geared more towards a young child I think. Always trying to think of new ways to use what you have. Do you have a picture of the entire closet? Hard to tell what the layout is from the close-ups. I love your closet system!! We need to redo ours. Our closet is about the same size and I love how the new system uses the space so much better.